Where earth’s greatest landmass narrows to a subcontinent, below where mountain thrusts up rock to earth’s highest peak and river runs down to dry plain, just beyond where land tips into ocean, in one slip of forest in the wet mid-hill tropics that rise up on a small island once bridged to south-east India, behind the obscuring branch of one jack tree, there is a blue magpie. We’ve come a long way for this bird. It is truly magnificent though. Don’t think your usual black-and-white, garden-menace job. The Sri Lanka magpie is of quite another order: blue body, blue tail – true blue, bluest in the forest – head and wings of dark tamarind, feet and a heavy corvid bill the colour of pomegranate arils. The same red neatly circles the eye. It’s a bird to travel for. Sri Lanka blue magpie. Image: Wikipedia Commons. In cloud forest, good views of anything can be hard; it’s alarm and frenzy in the tops, exotic calls and brief flashes above. Tall is habit in a place like this – trees reach 40, 50 metres high, their boles straight up into tree domain – but such thick vegetation down here obscures verticals and heights. The trick is to stand still, tune in to what you hear. In this valley, dawn is a broad coming like a passing eclipse. We stand in the green air on the edge of the clearing before the heat arrives, waiting for birds at first light. Orange-billed babblers are easy enough – their fuss and squabble shake the foliage with monkey-vigour. They are joined by the odd ashy-headed laughing thrush or drongo. Higher up, there are white-faced starlings and hill mynas. The rasp of the magpie gives it away. And where there’s one, more follow. We watch six in total, a raucous mob tailing each other from tree to tree for just two minutes, so plainly blue you wonder how they do such a good job of disappearing. The Rainforest Ecolodge in Sinharaja forest. We’re very pleased to see them. The thing is, you won’t find any of these birds anywhere else. Not just in Sri Lanka, but nowhere else in the world. Like so much of the immense biodiversity on this island – trees, insects, amphibians, reptiles, flowers, butterflies, mammals, birds – the blue magpie is an endemic. Sri Lanka’s ancient insular existence has evolved a remarkable ecology of highly specialised creatures. Amongst birds alone, of the island’s 27 full endemic species (there are subspecies too), most of these can only be found in the wet-zone hills in the far south, and some of these, even, only in isolated pockets of this territory. Only sixteen years ago, in fact, a new owl species was discovered in these forest fragments that survived colonial rule. It’s a reassuring sign in this age of loss and destruction. Sri Lanka hill myna. Image: Isuru Gunasekera. Find this little lodge near Deniyaya on Google Earth, scroll in, then right out to see India, and Eurasia, and the whole globe. This is to know the fragility of every part of all things, yet wonder that the infinitesimal can still hold mysteries. Today’s publication of Pope Francis’s encyclical on climate change has, expectedly, sparked fierce debate about the enviroment. It has required people to (re)consider, defend and articulate the human perspective on the natural world: how are we defined in relation to it, by it and as part of it? To what extent is the earth our property and resource (natural capital)? How ought we manage our relationships with our local and global environments? What part, if any, should religion still continue to play in our engagement with the natural world? For many, the Pope’s comments on the environment are refreshing and hopeful. For writers concerned with cultural and historical perceptions of nature, there might be a further resonance, however: a new dialogue with the centuries-old, dominant Christian doctrine which has locked us into the idea that we are somehow separate to and inherently superior to other species. The notion that human rights and conveniences naturally come first, that every other being we lump into that vast ‘animal’ category are there to be exploited and used by us, still has a hold (who has not resorted to naming, however flippantly, uncivilised behaviour as ‘animal’?). In a George Monbiot article on this topic, I was directed to the website of the Cornwall Alliance for the Stewardship of Creation (a US Christian organisation), which talks of ‘God-given dominium‘ and the ‘imago Dei’ as part of its plea to the Pope to reject plans to reduce burning fossil fuels. It is hard for a medievalist to read such words without thinking on typical medieval theories about man’s dominant position in the hierarchical chain of being. There is Isidore of Seville, for instance, who reminds us that the ‘human stands erect and looks towards heaven so as to seek God, rather than look at the earth, as do the beasts that nature has made bent over’ (Etymologies, Cambridge, 2006). Other writers, from Thomas Aquinas to Boethius to Bartholomew the Englishman echoed these sentiments. There is a striking resemblance to the Cornwall Alliance’s view: ‘Good climate policy must recognize human exceptionalism, the God-given call for human persons to “have dominion” in the natural world (Genesis 1:28)’. And this: ‘the physical world … [is] an ordered cosmos that rational creatures can understand and harness for human betterment; private property rights, entrepreneurship, and widespread trade’. Royal 12 F. xiii, f. 34v. Detail of Adam naming the beasts according to their uses. Source: British Library catalogue (public domain). As a medievalist, it’s fascinating to see how the medieval lingers in our own times. The Alliance’s standpoint certainly shows the longeivity of some medieval doctrine. But I am also uncomfortable with how their argument positions itself in relation to the medieval view, what they refer to as the ‘one culture nurtured for centuries in the Biblical picture of reality’, as though continued explotation of the earth right now can be justified through this comparison. Putting aside the fact that many – religious and secular alike – would query such a ‘picture of reality’ several hundred years on, the bigger problem for me is that this vision wasn’t exactly cut and dry even in the medieval period, so it seems a little shaky to be using it to substantiate arguments in the 21st century. What recent medieval scholars have been busy showing, in fact, is that the medieval ‘picture’ was far from uniform; it was riven with contradictions, variations, inconsistencies and ironies. My own work in this field has suggested how writers were very capable of complicating and destablising the usual representation of the human and non-human relationship, ridiculing it even (see here). 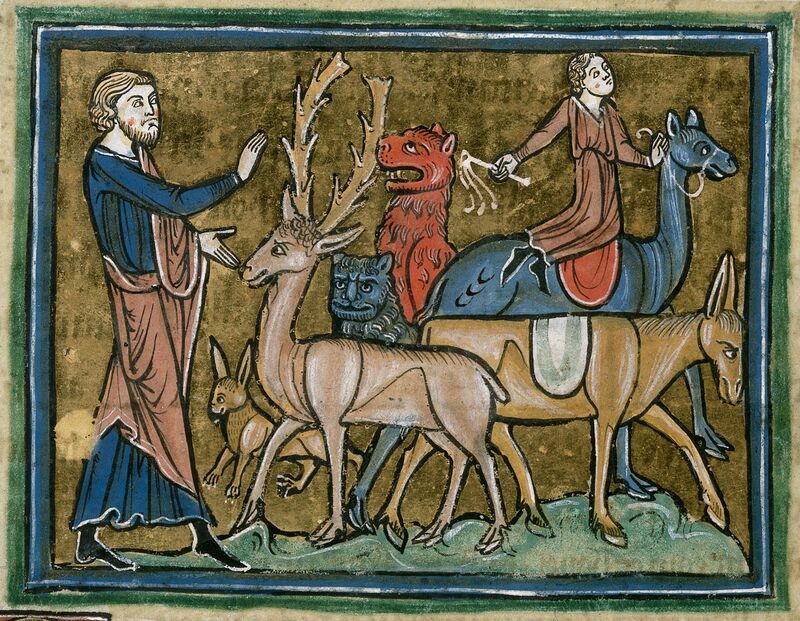 In fact, a good number of medieval works suggest that ‘conceptualizing the animal realm was an ongoing, undecided question’ (Susan Crane, Animal Encounters, 2013). It seems to me that little has changed, and that if medieval thinking admitted these sorts of variations, then so should ours. It’s one reason why continued and renewed study of early attitudes towards the natural world is vital; it can do much to inform what we think and do now.